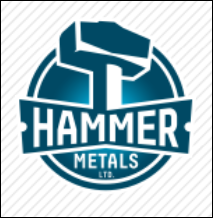 Hammer Metals (ASX:HMX) has just made some truly significant intersections of copper, molybdenum and rhenium from its flagship asset, Kalman. 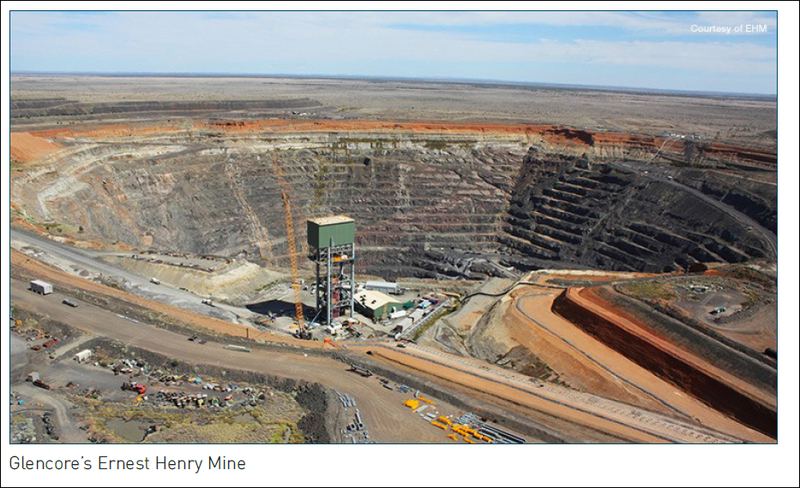 HMX’s Kalman sits in the star studded Queensland Mt Isa mining region. 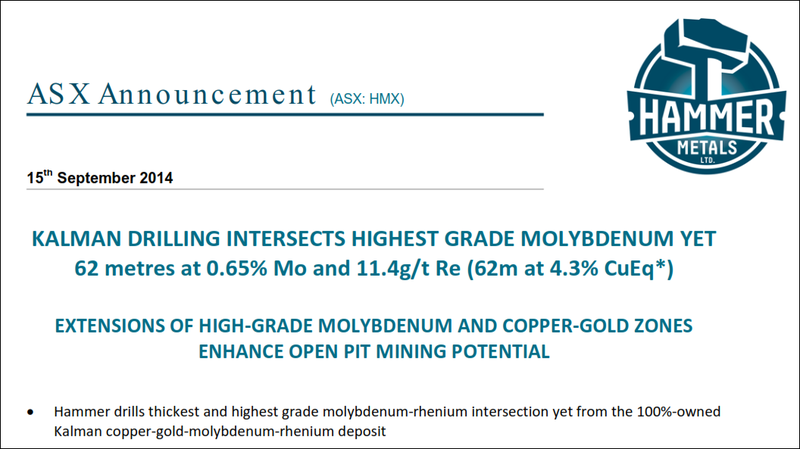 With latest intersections like 62m at 0.65% molybdenum and 11.4g/t rhenium, which equates to a copper equivalent of 62m at 4.3%, HMX have hit their highest grade molybdenum yet. This drilling work has found a new, near surface copper-gold zone located outside the current resource model – it looks like HMX’s Kalman inferred 30 million tonne resource at 1.3% copper equivalent might be getting a lot bigger. Kalman appears to be open just about everywhere – HMX is planning follow up drilling right now. 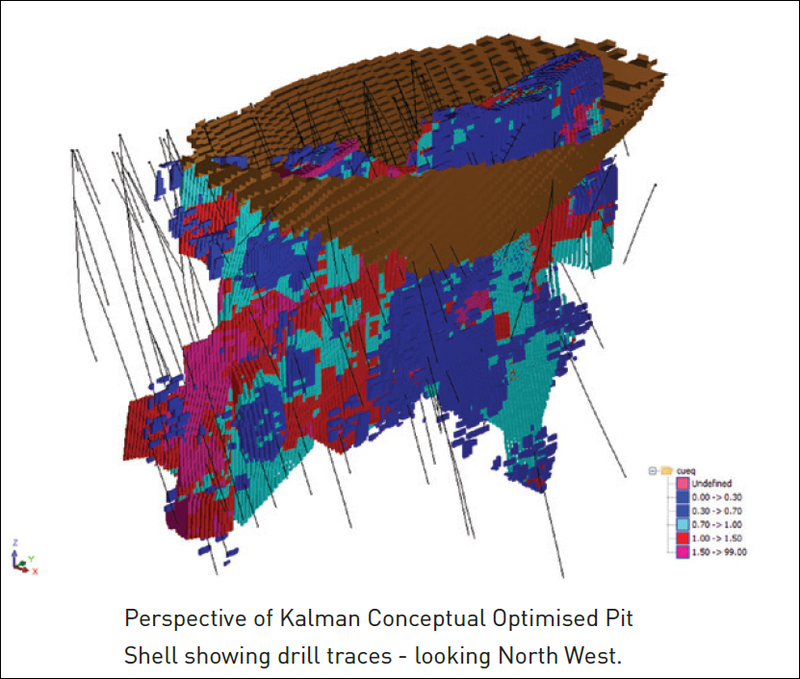 The recent drilling has enhanced the potential for open pit mining at Kalman – continued results like this keep improving the economics of extracting minerals here. 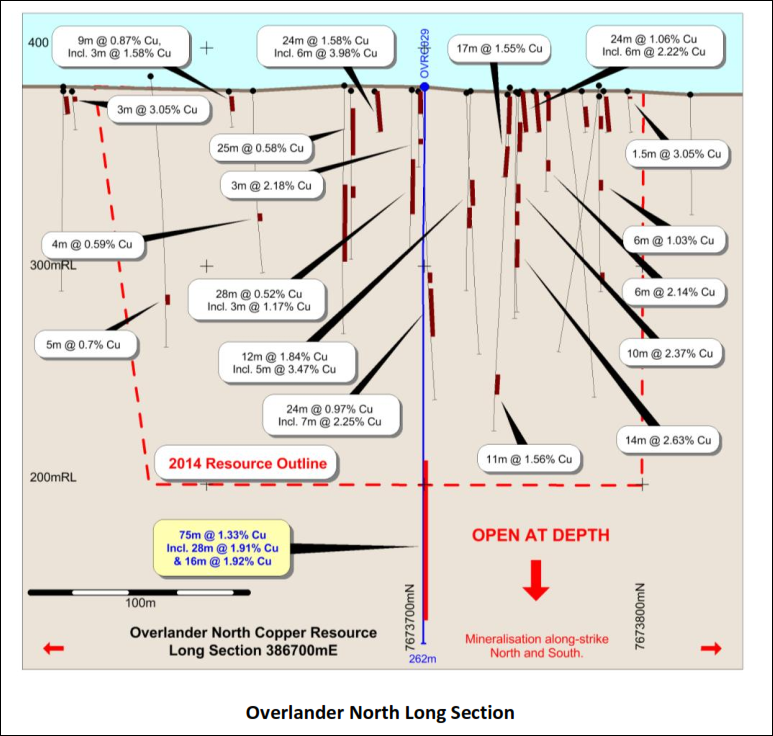 To add to this, the latest drilling result at HMX’s Overlander North Project struck a notable 75 metres at 1.33% copper – the best result yet here. This result indicates that the mineralised zone appears to be more consistent in grade and thicker with depth... 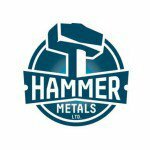 The Overlander Project is yet another Inferred Resource that HMX have – 1,157,000 tonnes at 1.2% Cu. A downhole EM survey is due to start shortly at Overlander. 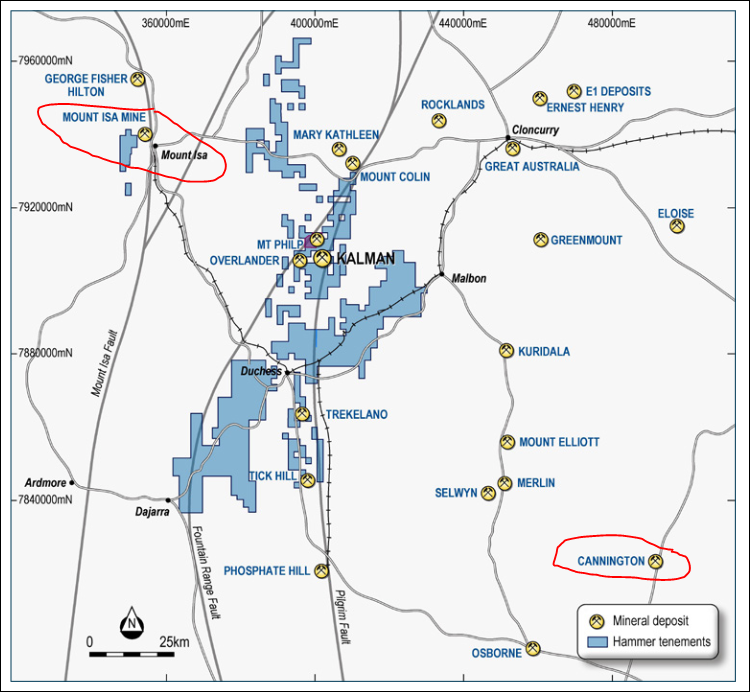 Cannington, the world’s biggest silver mine, controlled by BHP, is on one side of HMX’s ground, and Glencore’s Mt Isa copper mine, the biggest underground mine the world has ever seen on the other. And it’s not just BHP and Glencore... there are also mining heavyweights Chinalco, CuDeco, Chinova, MMG and CopperChem all with a swarm of huge deposits around HMX. 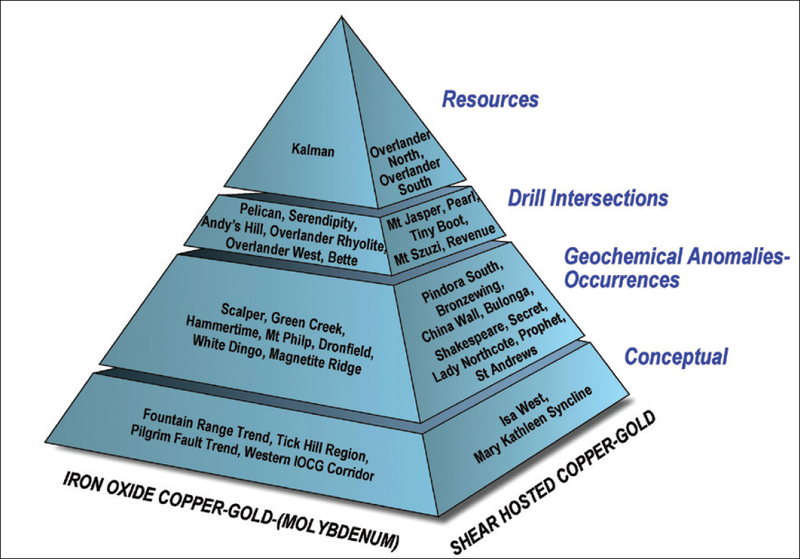 HMX also has the potential to define a large IOCG system west of Kalman, and copper-gold targets with high grade zinc around the Mt Morgan mineral field. HMX have mining assets at every stage of the exploration cycle, which should ensure a long lifespan and an ideal ramp up towards becoming a mid-tier producer. Little HMX is currently capped at just $11.5M. There is more high impact drilling coming up for HMX, so these latest results could be just the beginning of quite a ride for HMX investors. We particularly like HMX for its high grade rhenium resource – there are precious few ASX juniors with material exposure to this metal. Two holes were drilled in the Kalman area to infill a poorly tested section of the upper part of the main ore and test for potential strike extensions at the northern end of the deposit. 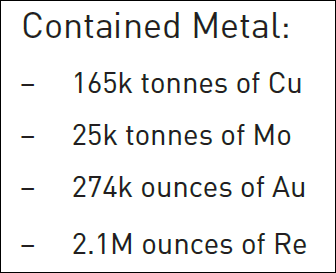 Results from the infill hole included 62 metres at 0.65% molybdenum, 11.4g/t rhenium, 0.16% copper, 0.07g/t gold and 1.5g/t silver, for an equivalent of 4.3% copper. That intersection included 7 metres at 3.44% molybdenum, 57g/t rhenium, along with copper, gold and silver, for a 21.8% copper equivalent from 206 metres. These hits were among multiple other broad, high grade intersections. The results certainly reinforced the robustness of the Kalman deposit. 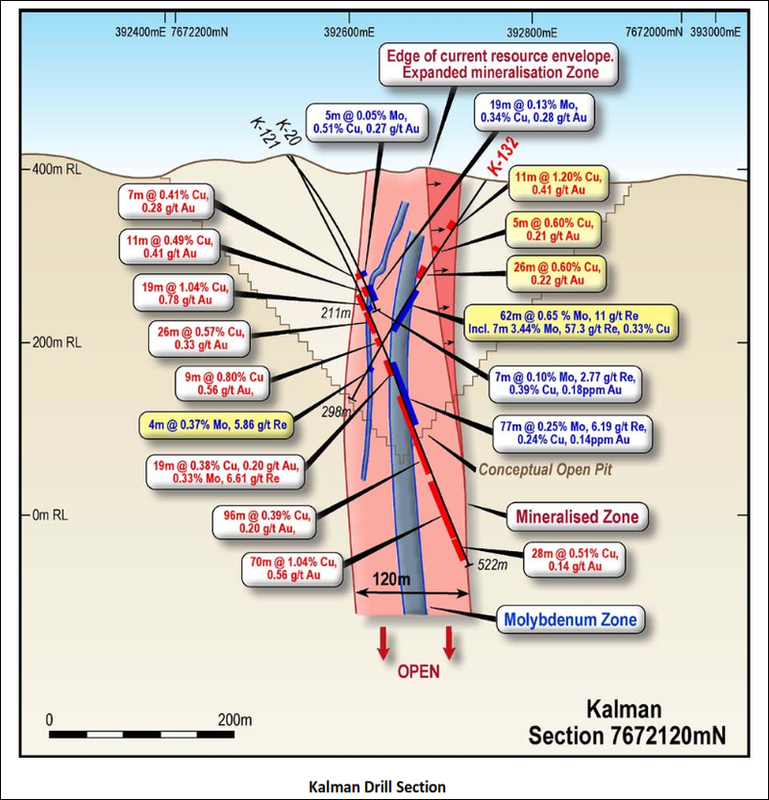 You can see for yourself in the image below that Kalman is very heavily mineralised... and given drill spacing to date has been quite wide, there is potential for a whole lot more metal to be confirmed. Overlander – A Flagship Asset in its Own Right? An interval of 75 metres at 1.33% copper and 667ppm cobalt from 176 metres was returned. Overlander is a substantial asset – we have seen similar projects supporting a market cap of over $10 million on their own. 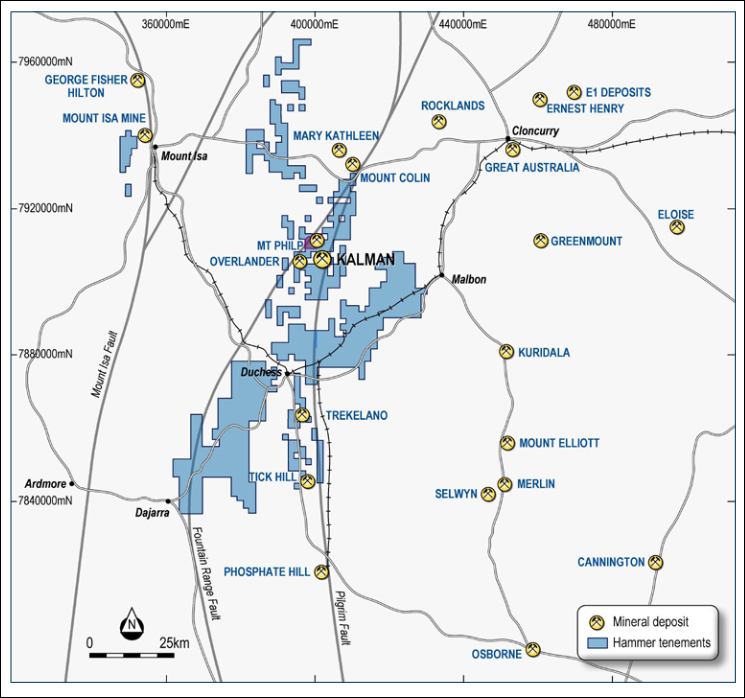 HMX have one of the largest land positions, in Australia’s biggest mining province, wedged between two of the world’s most prolific mines. 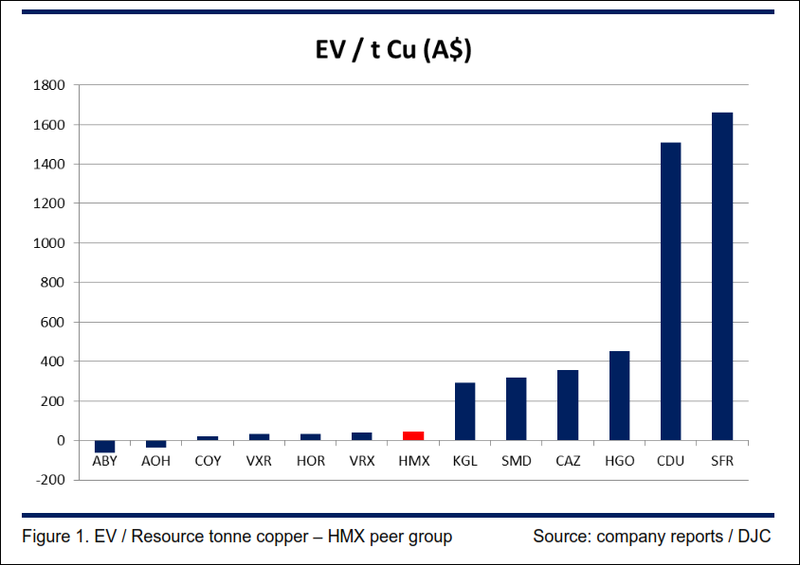 The average enterprise value per contained tonne of copper for explorers in HMX’s peer group is $156... That’s more than triple the valuation currently given to HMX, with a metric of just $43. On this basis HMX’s 155,000 tonnes of contained copper equivalent should have an enterprise value of $18.75 million, which implies a market cap of around $20 million, or 28c per share. This is how DJ Carmichael arrived at its valuation for HMX. And this doesn’t even ascribe any upside to HMX’s very sizeable exploration potential. At the same time, this isn’t a guarantee that HMX will ever reach 28c per share – an analysis of peers doesn’t not always equate to the true market value. Kalman is a mighty big unit, but it looks like it could get much bigger. Those big deal exploration results we covered above have been hitting investor’s screens over the last week or two, and the herd is starting to stir. It’s not surprising with copper equivalent hits of 62 metres at 4.3% at Kalman, and 75 metres at 1.33% copper at Overlander. 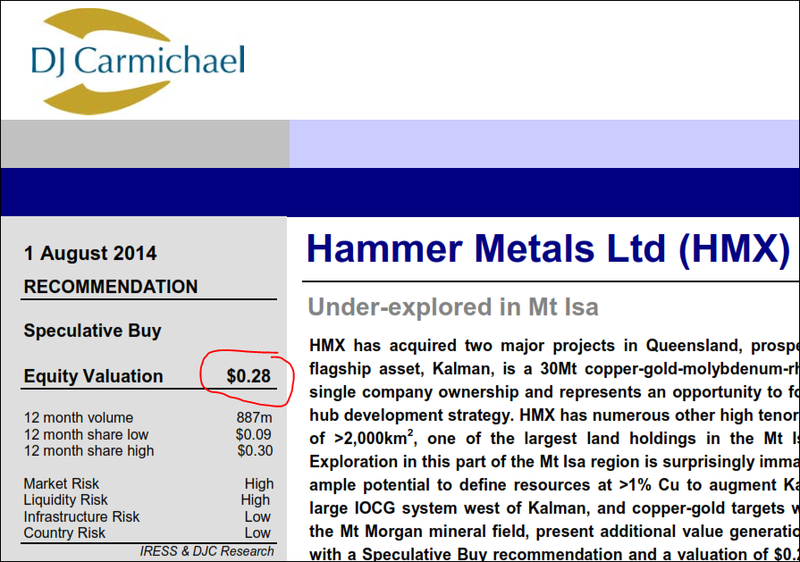 HMX is also well funded with cash reserves of around $1.5M, with another $1M due from the sale of its Mt Philp iron ore project likely on its way early in the New Year. HMX have thick, high grade, multi-metal intercepts from already substantial deposits that are within kicking distance of two of the planet’s biggest mines... We particularly like HMX for its high grade rhenium resource – it’s hard to find an ASX junior with exposure to this metal. Should rhenium prices boom again to $12 million per tonne, every man and his horse may be chasing HMX stock. Of course, HMX remains a high risk speculative investment – they are still a mineral explorer at this stage and subject to commodity prices out of their control. HMX have a flagship asset that you might see from a company triple the size, and there is plenty more high impact drilling in the near future. HMX’s vision of a central mining hub surrounded by smaller deposits, coming together to form a sprawling but cohesive operation is starting to emerge.